If you read my post of Globecraft Memories today you’ll know that I’ve been making cards this week – and staying up WAY too late! Been playing around with our Piccolo Card Decor & More packets and really liking ’em! Love that all the pieces coordinate, punch out easily and have lots of detail. For this one I basically used several varieties of our Piccolo Enamel Powders – look at all the color on those gears! 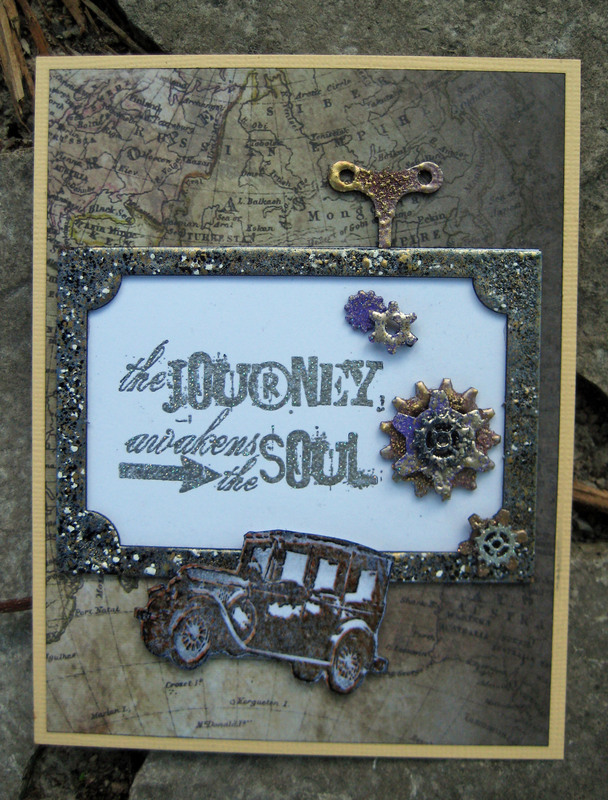 Titled, “the journey awakens the soul,” the old jalopy and map paper from Tim Holtz mix great with the Vintage Gears, ST002 pack. After punching the pieces I decided to use our enamel powders and couldn’t decide which so used several! This is Temple Stone on the frame. Our enamels have varying sizes and colors of enamels mixed so you get all that great Earthiness and texture. 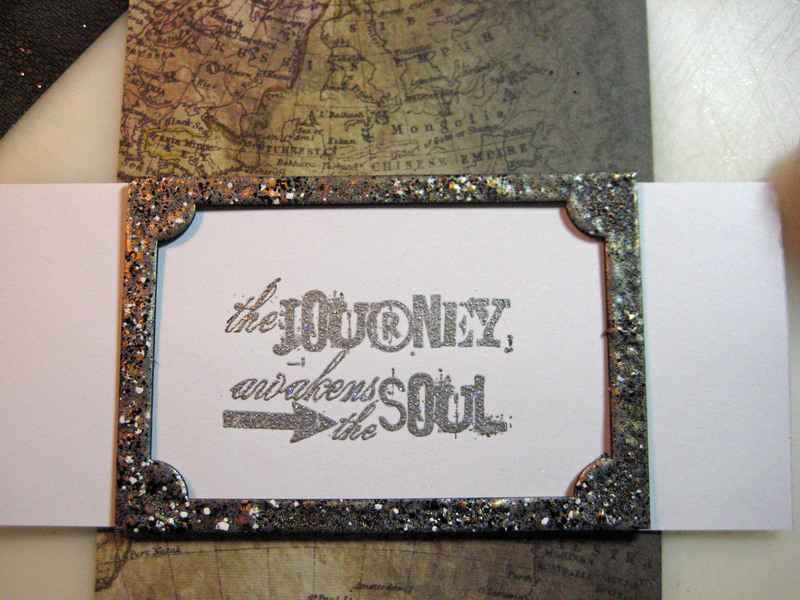 The sentiment, Tim Holtz stamp CMS 063, uses Siam Silver. 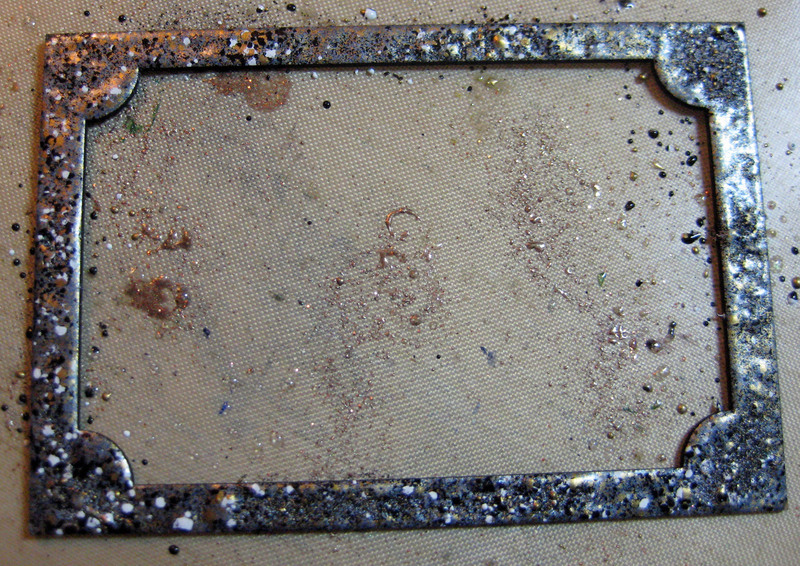 Like our 24K Gold, there is a fine silver glitter mixed in with the enamel. It is really pretty, especially when the light catches it. I stamped on white cardstock using our Piccolo Embossing Powder adhesive which comes in a dabber bottle! It is so easy to use and gives great coverage for the enamel powders! This is the finished piece. Vintage Silver, Mardi Gras, Royal Sterling and Vintage Gold are used on the various gears and handle. See how the handle has lumps and bumps near the center? You can achieve that look with the Flash Heat technique of not heating the enamels all the way through. It gives it more of an organic and rustic appearance which I really like. The jalopy is from Tim Holtz Mini Muse CMS 063 stamp, stamped with Ranger’s Pitch Black Archival Ink then a coat of Glossy Glastique brushed over the top – feels really cool. I popped it up with dimensional foam squares and angled it slightly to make it look like it might be really traveling along the road. Hop on over to our blog at Globecraft Memories for an entirely different card using our Piccolo Vintage Grape Vine, F010. Beautiful, Linda! Love the frame and the map paper was the perfect backing. I love how you make everything you do reflect your own personal style. This is just so beautifully vintage and cool! You know I really wish I lived with you, it seems like it would be the greatest experience in the world! Oh yeah! Just ask my husband! Absolutely beautiful! I love the old vintage car theme. Thanks! I love vintage too.